in an aloha shirt from Tapestries. Lauzanne Oshiro and Representative Marcus Oshiro in matching outfits from Tapestries. Emcee Jordan Segundo sings "You Raise Me Up"
The Hui Makaala Fashion Show on Sunday, October 26, 2008 at the Sheraton Waikiki Hotel, paired glamour and good times for a great cause. 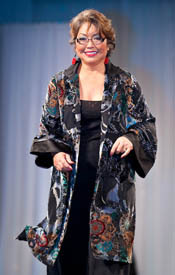 The show featured the designs of Harari, led by Okinawan-Japanese American Creative Director Barbara Keller, who utilizes beautiful and exotic silk prints. Also featured was Ryan Roberts, a Canadian designer transplanted to Los Angeles, who has an understated and sophisticated collection. 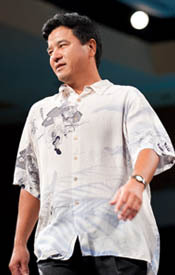 These fashions were joined by timeless clothing from local kama`aina retailer, Tapestries by Hauoli (located in Ala Moana Center and Pearlridge). Guest models sauntered down the catwalk with confidence and style. Vendors set-up before guests arrive; volunteers set corporate tables with centerpieces generously donated by Awamori Spirits, LLC (Randy Kuba), Sephora, and favors donated by Menehune Mac. L-R: Patsy Kishimoto, Patsy Young, Wendi Nagata and Reservations Chair Vicki Kitajima warmly greet guests. Beginning at 9 am, boutiques in the foyer began selling clothes, accessories, foods and crafts. Doors to the ballroom opened at 11:30 and Emcee Jordan Segundo enthusiastically greeted approximately 700 attendees. Lunch began after The Queen's Prayer was sung by Tina Kaneshiro, and it consisted of Mimosa Salad, Macadamia Nut Pesto Chicken in Madeira Sauce with Garlic Mashed Potatoes and Asparagus, and Okinawan Sweet Potato Ice Cream for dessert. 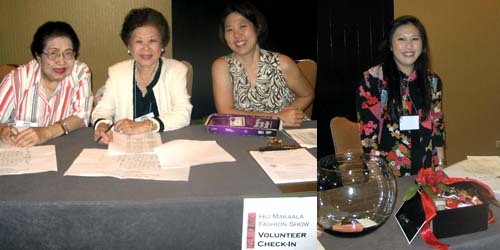 L-R: Elsie Kawakone, Sarah Mitchell & Miki Lau generate food sales; Jennifer Kokuba, Kelly Muranaka and Donations Chair Rena Takushi oversee 70 silent auction items; Club Vice-President Eric Nitta generates interest in the silent auction. Entertainment by the Young Okinawans of Hawaii, Eric Nitta and Jon Itomura, performing the Shishimai, got the event off to a lucky start!Then, the Paranku Club of Hawaii, under the direction of Sensei Violet Ogawa and Sensei Pat Koki, enchanted the audience with their performance on the traditional Okinawan hand drum. Next our emcee and Hawaii's idol, Jordan Segundo, sang the inspirational song, "You Raise Me Up". 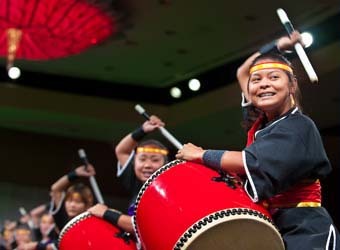 Concluding the entertainment, the deep resonating taiko drums of the Ryukyukoku Matsui Daiko Hawaii, under the direction of Sensei Akemi Martin energized our guests for the exciting Fashion Show. After the announcement of lucky doorprize winners and centerpiece raffle winners, Co-chairs Val Kato and Jennifer Waihee explained the importance of the fashion show to raise funds that allow Hui Makaala to award educational scholarships to students who appreciate and promote the Okinawan culture. 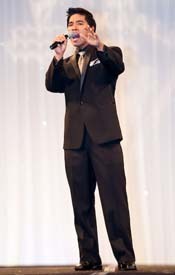 In 2008, nine scholarships totalling $20,000 was awarded due to the support of Fashion Show attendees. Then, the show began with fashions from Tapestries by Hauoli, narrated by Jordan Segundo. Following Tapestries, Kelsey Farris, celebrity stylist and designer representative from Los Angeles, presented the glamorous designs of Ryan Roberts and Harari. L-R: HUOA President Jon Itomura in an aloha shirt from Tapestries by Hauoli; HUOA Past-President Laverne Higa in a dress from Tapestries; Representative Scott Nishimoto in Ryan Roberts. L-R: Keith Kaneshiro and Debbie Cheeseman in fashions from Tapestries; Lynn Uehara in Harari, and a model in Ryan Roberts. After many months of hard work by the Fashion Show Committee and Co-Chairs Val and Jen, the Fashion Show was a smashing success! If you attended the Hui Makaala Fashion Show, we gratefully offer you our thanks and we hope that you please join us at next year's Fashion Show! It is sure to be wonderful! 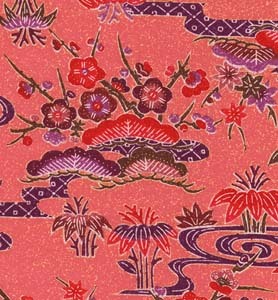 Yamasato, Fujiwara, Higa & Assoc.